Unfriended: Dark Web joins a group of friends for game night. Unable to meet face-to-face, they instead play Cards Against Humanity over Skype. In real time we watch the screen of Matias’ new computer which he ‘came across’ that day. He flicks between a Facetime Messenger video call with his deaf girlfriend and the rest of the gang. As the evening unfolds, Matias gets help to unlock hidden files on the laptop and after 40 or so minutes of meaningless malarkey, a dark and sinister plot comes to light that threatens the circle of friends as an unseen man tries desperately to recover his property. 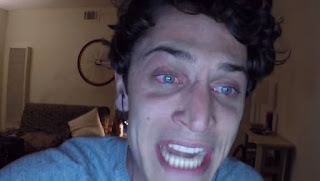 Colin Woodell plays the permanently flustered protagonist, Matias, who is juggling a lack of computing power with his attempts to avoid learning Americal Sign Language to properly communicate with his increasingly disenfranchised lip-reading girlfriend Amaya (Stephanie Nogueras). The character development of the games night participants – cute couple Nari (Betty Gabriel) and Serena (Rebecca Rittenhouse), DJ Lexx (Savira Windyani), IT geek Damon (Andrew Lees) and AJ (Connor Del Rio) – plays second fiddle to the murky plot, and their backstory and reasons for friendship are never fully explored. While it’s laudable for writer and first-time director Stephen Susco to experiment to see if the found footage genre could be expanded to include computer-based material, he has not made a horror film. While momentary licence is taken at key plot points by adding deep and subtle sound effects that are external to the otherwise sterile soundscape, the filmmakers struggle to build any tension and do not intimidate their audience with scares. The on-screen events are clearly frightening for the fictional characters, but my stomach certainly didn’t lurch in sympathy as the glitchy villain invaded the gamers’ privacy. The 16:9 aspect ratio works well and supports the dramaturgical niftiness that keeps the focus on particular characters during the main five-way Skype call between the friends. The use of commands in the Skype chat window is relatively realistic, though the IP address beginning ‘617.___’ is a forced technical error that should have been spotted. 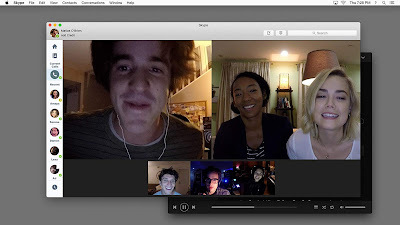 Overall, Unfriended: Dark Web is a poor demonstration of the horrors that may lie in corners of the actual dark web. While there have already been a few cinematic turkeys this year, this definitely makes the list with its slow burn brand of non-horror, only rescued by a mercifully short 92 minute runtime and a nice mention of ‘covfefe’. The makers of The Meg must have asked themselves what more could sensibly be added to the canon of shark films. It’s a well-established genre that regularly spills red blood into the blue sea and puts fear into the heart of nervous cinemagoers. The Meg begins on the offshore marine research platform Mana One which has been independently financed by a bearded billionaire (played by Rainn Wilson). He’s flown in to visit the team as they plunge one of their fleet of Thunderbird-like craft into the depths off the shore of China. “There’s something out there” is an apt if unoriginal line in the script which foretells the need to rescue the submersible’s crew. And who better to ride to their rescue than Jonas Taylor (Jason Statham) once they find him “washed up on a Thailand beach”. He nicknames the underwater enemy ‘The Meg’, not short for Margaret, but instead referring to Megalodon, a presumed-extinct species of giant prehistoric shark. Masi Oka (familiar from the role of Hiro Nakamura in Heroes) plays adolescent joke-cracking Toshi who is the early indication that any underwater doom will not be needlessly gloomly. Jason Statham plays the hero whose name’s similarity to Jonah cannot be accidental and is given his own theme song Mickey. Jonas shifts from being diffident to cocky and finally altruistic, sparring and then sparking with Suyin (Bingbing Li), the plucky and head-strong daughter of the Mana One platform chief. 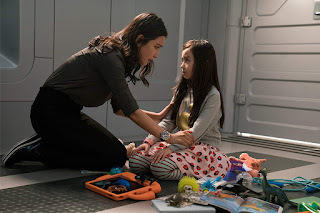 Her daughter Meiying (Shuya Sophia Cai) steals most of her scenes, along with an accesorised Roomba that quietly slides down the underwater corridors, and a cute dog called Pippin (in a nod to Jaws). 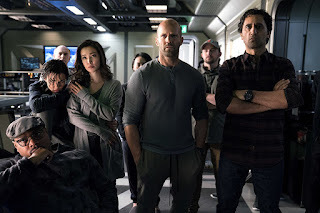 The Meg doesn’t take itself at all seriously. Yet it stops short of knowingly becoming an Airplane! or Galaxy Quest spoof. If you walked out if the cinema after the first 40 minutes you’d be satisfied with a perfectly serviceable, complete, TV-length episode that could reboot Seaquest DSV (minus the talking dolphin). Stay for the next hour and a quarter, and you’ll begin to question why it’s taking so long to crack the jokes, kill off the bad guys, and hint at the prospect of romance. While you may be unfortunate and have a ‘jumper’ in the seat in front of you, The Meg isn’t a scary film. The inability for the scriptwriters and the director (Jon Turteltaub) to find a conclusion creates a Bond-like series of false endings whose moments of peril are well diluted with wise cracks and a game of Pokemon where you’ve gotta to catch em all. 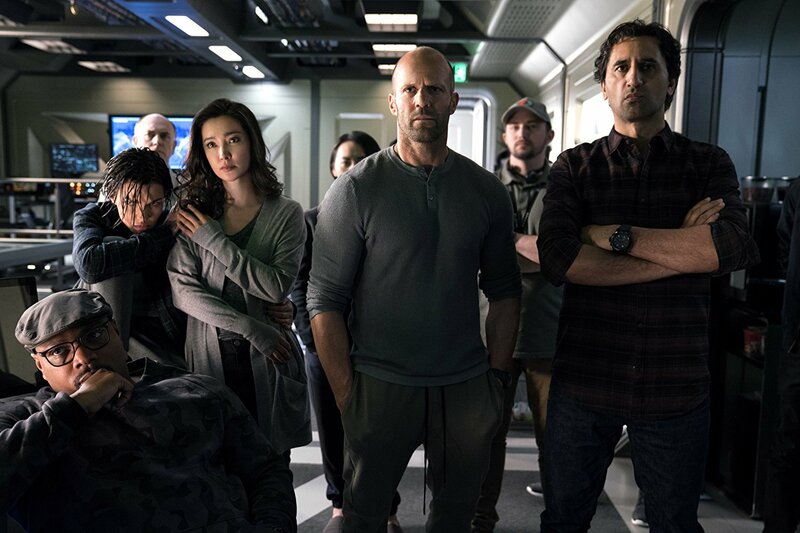 The Meg opens at UK and Ireland cinemas on Friday 10 August. A tub of Ben & Jerry’s Phish Food would be the perfect snack to bring! 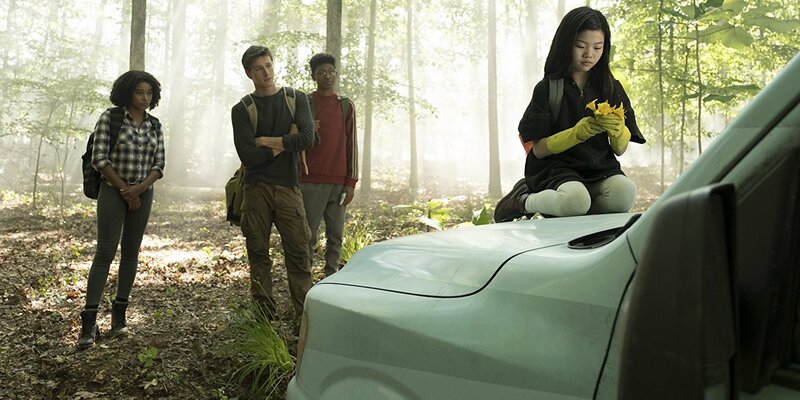 The premise of The Darkest Minds is that a majority of children across North America – the filmmakers’ boundaries stretch no further than the US – have been killed by an outbreak of Idiopathic Adolescent Acute Neurodegeneration (IAAN). While the near-annihilation of children causes the economy to tank, the remaining children are viewed with suspicion and the new superpowers that helped them fend off the disease cause them to be interned in camps by military wearing yellow suits. Ruby has mind-altering abilities. Played briefly as a small child by Lidya Jewett, it’s Amandla Stenberg (Rue from Hunger Games) who takes over the role six years later and plays it with empathy and resilience while remaining as always-on-edge as might be expected from someone with special enough powers to carry a target on her back. As an actor, she deserves a better vehicle to show off her talent. Breaking free and heading across state boundaries towards safety, audiences learn that her travelling companions have lesser powers: Liam (Harris Dickinson) can move objects – think Quake from Marvel’s Agents of SHIELD but with less sass and less gorm; Zu who brings a spark to any party appliance is cute but her character is only ever used as an emergency exit; and Charles/Chubs (Skylan Brooks) who has been written as one dimensional super smart nerd who can’t see far without his glasses. 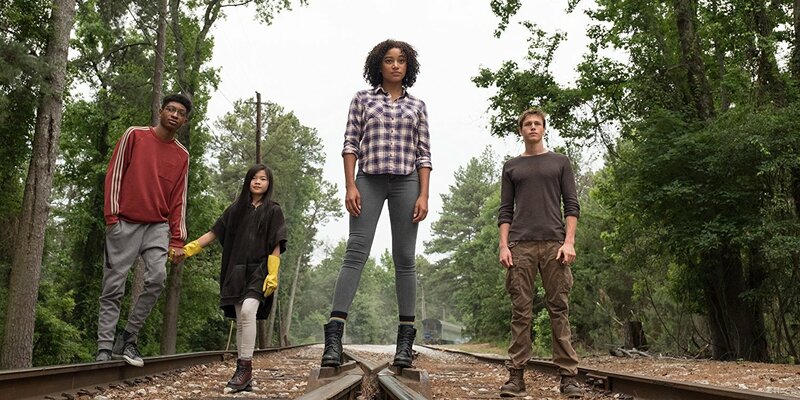 The Darkest Minds wants to be the next Hunger Games. It could be a female-led apocalyptic survival franchise with young people rage against other young people as well as fearful adults. But instead it edits together moments of Mad Max, Watership Down, Animal Farm, Vulcan mind-melding and throws in the Scooby Doo van and the Child-Catcher from Chitty Chitty Bang Bang for good measure to make a ‘young adult’ science fiction adventure that surely underestimates and under-stimulates the minds of the teenagers it so wants to entertain. Good and evil are mixed up. No one can be trusted. Important lines are repeated. No one can be trusted. The narration is over-the-top, and lines like “we’re going to need another doctor” that may once have looked funny on paper fall flat when projected onto the big silver screen. Logic goes out the window when the gang – who have been chased while driving along the road – choose to abandon their trusty vehicle and walk. I didn’t catch any explanation about why the US has remained childless, and why the older teens remain unencumbered by romance and pregnancy in their new post-IAAN free world. So many questions that a TV mini-series – and presumably Alexandra Bracken’s original novels (five in this series at the time of writing) – would have time to explore. But not in this 104-minute cinematic catastrophe. The clichés come thick and fast: power(s) come with responsibilities; diversity is good; never be ashamed of who you are. Could it be that director Jennifer Yuh Nelson’s switch from animation to live-action has brought the sensibilities and pace of one genre into another without sufficient adaptation? Or am I missing something new and vibrant by being a stick-in-the-mud? The makers of scandi-noir The Snowman admit that they ran out of money and edited the film together without all the scenes being shot. The makers of The Darkest Minds don’t seem to have that excuse. But they took a flimsy script and padded it out to make a film that will kill brain cells of those who watch it in a tribute to their fictional IAAN! I thought that January’s release of Maze Runner: The Death Cure was a plague on teen thriller adaptations. Boy oh boy was I wrong … Or maybe I’m clueless! Maybe The Darkest Minds will be a wild success at the box office this summer, entertaining courting teens and others who want something light and fluffy with a bit of action to entertain but no gore or horror to upset. 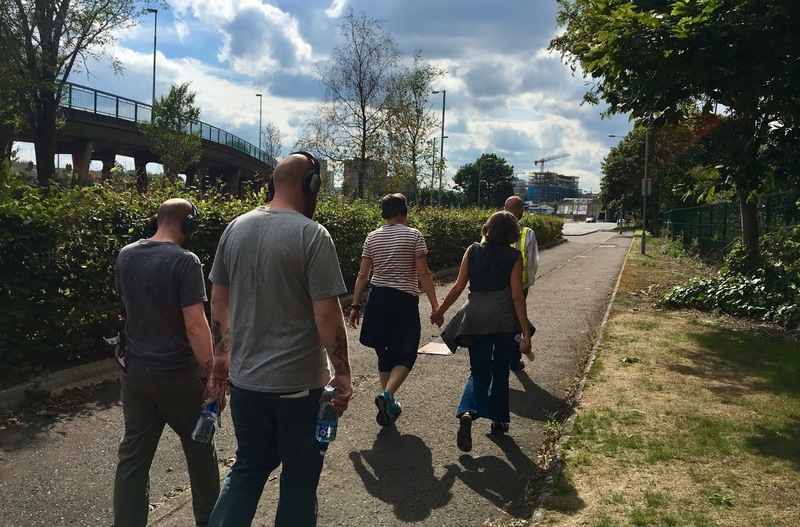 Walking across Belfast in a group, we’re listening to the stories of members of The Rainbow Project’s Gay Ethnic Group (or GEG as they somewhat tongue-in-cheek refer to themselves). Each has made a different journey for different reasons to end up in Northern Ireland. Some are claiming asylum, some have been refused, some acknowledge that they fall outside the definition of refugees. Through So I Can Breathe This Air, all are telling us about the mixture of bureaucratic, social, racial, religious and financial challenges they face as they seek to integrate. We’re wearing headphones, having synchronised pressing the play buttons on our MP3 players. Our guide – Noel Harron – wearing a fluorescent yellow vest pauses and we stare across a street. The building facing us might be referenced in our ears at that moment, or perhaps a character brushing past (Martin McDowell) represents the person whose story we’re listening to. The acting is subtle and the actors – particularly the many women played by shape-shifting Holly Hannaway – often attract the attention of passers-by (some of whom come close to intervening) as she bangs on doors or stumbles along the pavement. Ultimately we become hypervigilant, bringing all kinds of random people on the Belfast pavements into the story we’re building up in our minds. Reviewing another audio walking theatre piece Quartered: Belfast, A Love Story last November, I wrote about the challenge of walking a mile or two in somebody else’s shoes. There’s something very intimate about walking along with other people’s stories in your ear. Shannon Yee (Reassembled, Slightly Askew) is a master of new forms of storytelling, yet never lets the technology trump the narrative. The audio is beautifully crafted by sound designer Isaac Gibson and director Niall Rea. This isn’t just a set of recorded interviews that have been cut and paste together and exported out to an MP3 file. The voices are crisp and clear, and the subtle binaural (I assume) affect places the words at a slight distance to your ears, making it more like walking down the street listening to someone than merely listening to a podcast. Music and street noise adds to the realism. Starting out at Europa Bus Station and meandering eastwards, plenty of time passes – not to mention miles passing underfoot – to relax and be drawn into the oppressive asylum system and its methods of crass intrusion and overly-suspicious investigation. A change of mode of transport at one point provides a reminder of what it’s like to feel lost and having to navigate somewhere unfamiliar, yet perpetually on the march with no end in sight. 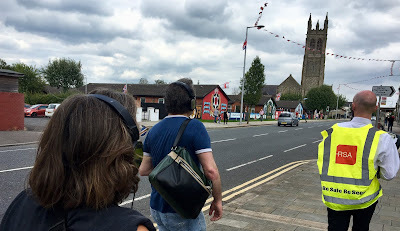 Any notion of complacency is also challenged early on with questions about quite how progressive society is in Northern Ireland compared with the experience of some of the GEG participants back home. Some of the external reflections on our local peace process are illuminating too. As too are the often, though not universally, negative experiences with churches and people citing religious faith as their reason for exclusion. It’s a sterling exploration of belonging, love and identity – to all of which food is often associated! – and the struggles that build resilience among those who can survive. Where do I belong? Where is home? Questions that we often take for granted. The performance is long. On a dry Sunday afternoon, it was a joy to be outside. On another day with inclement weather, it would have been quite a trudge since the pace of the audio cannot be altered. Yet the subject matter and the real and very personal stories from GEG deserve our attention given how rarely they are told and how rarely we bother to listen out to hear them. So I Can Breathe This Air is running as part of EastSide Arts Festival and continues twice a day on Monday 6 and Tuesday 7 August. The journey from Great Victoria Street across to the Newtownards Road takes approximately 2 hours 10 minutes. It takes another 40 minutes if you need to walk back to the beginning. There is an opportunity for a comfort break and light refreshments along the way. Knit together from a large collection of Jimmy Ellis’ poems, Glenn Patterson has crafted a nostalgic series of vignettes describing war-time life in Ellis’ family home. The well-known actor’s verse is a fond and loving tribute to his parents rather than a self-indulgent memoir of his own life. The director and creative team have woven period music and songs around the narrative, creating a rich and evocative production. The rehearsed reading of Jimmy Ellis: Home Again was performed as part of the EastSide Arts Festival in St Martin’s Church off the Newtownards Road. Dust sheets cover furniture in a deserted house. 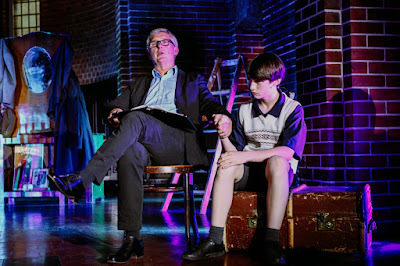 Stuart Graham plays Jimmy and remains on stage throughout, mostly sitting in a chair to one side of the chair delivering the stanzas that tell the story. 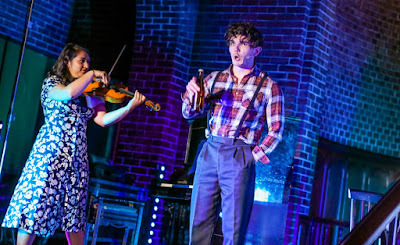 While the spoken words paint pictures of life in 30 Park Avenue with its runaway dog and the lodgers – flappers and down in luck Lords – as well as the shipbuilding and war efforts in the surrounding area, it’s the music that lights it all up with emotion. 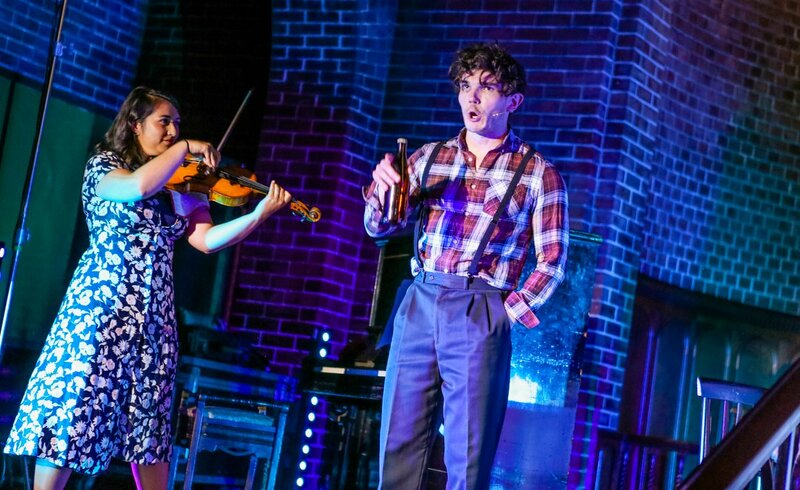 While Graham shows of his dynamic control of the script, Fra Fee and Clare Galway demonstrate their huge talents and versatility as musicians through voice, piano, flute, violin, tin whistle and more. My Love is Like a Red, Red Rose was a particular joy to listen to. 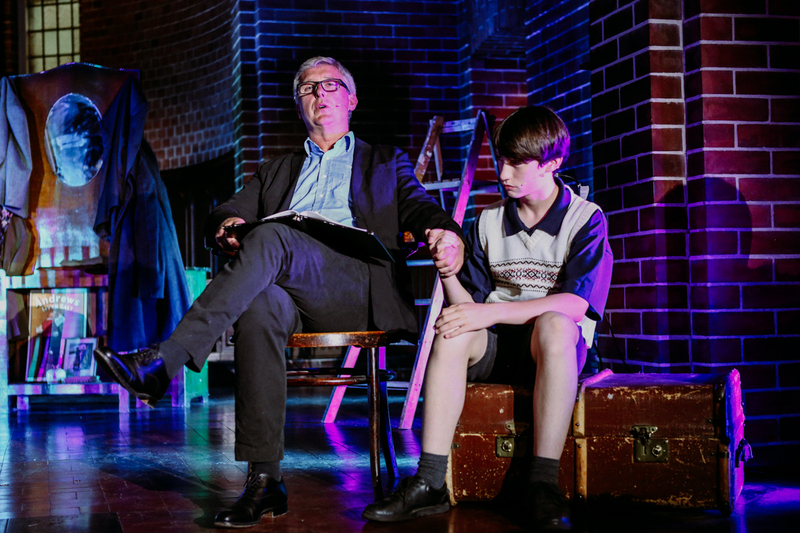 Katie Tumelty steps on stage as mother Tilly – effective but underused – and Michael Nevin plays young Jimmy whose stirring solo closes the 65 minute show. The production values were high for a mere rehearsed reading. 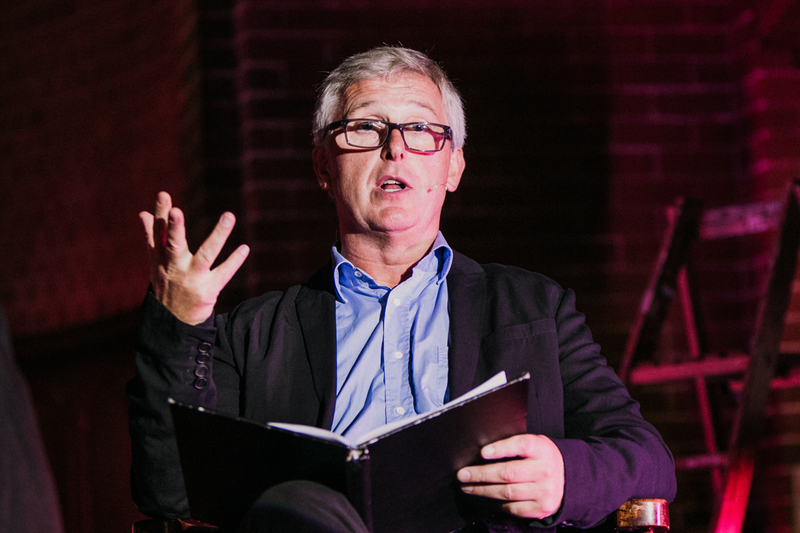 The synchronisation between music and poetry was magnificent, precisely meshing together Graham’s phrases with Fee’s control of the accompanying tunes to create wonderful moments of intersection. 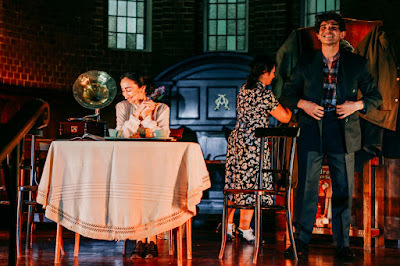 Having been woefully under-impressed with a recent nostalgic production by a different company in a different theatre, I was relieved to find that there is life and vitality in the genre. Jimmy Ellis: Home Again shows how it should be done. Director Martin McDowell and producers Robina Ellis and Claire Murray have fashioned a warm-hearted tribute that echoes one of Ellis’ lines: “it’s the little things that make you cleave together”. 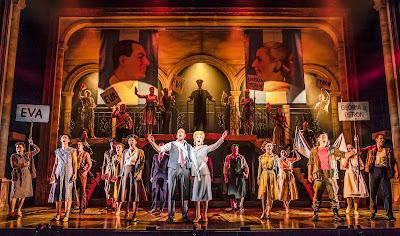 Evita has rolled into town. It’s the story of a young woman, Eva Duarte, a social climber who worked her way up through Argentinian society, stepping on the shoulders of every social class until she climbed to the very top and partnered up with Juan Perón, the military leader she would guide to become the country’s president. 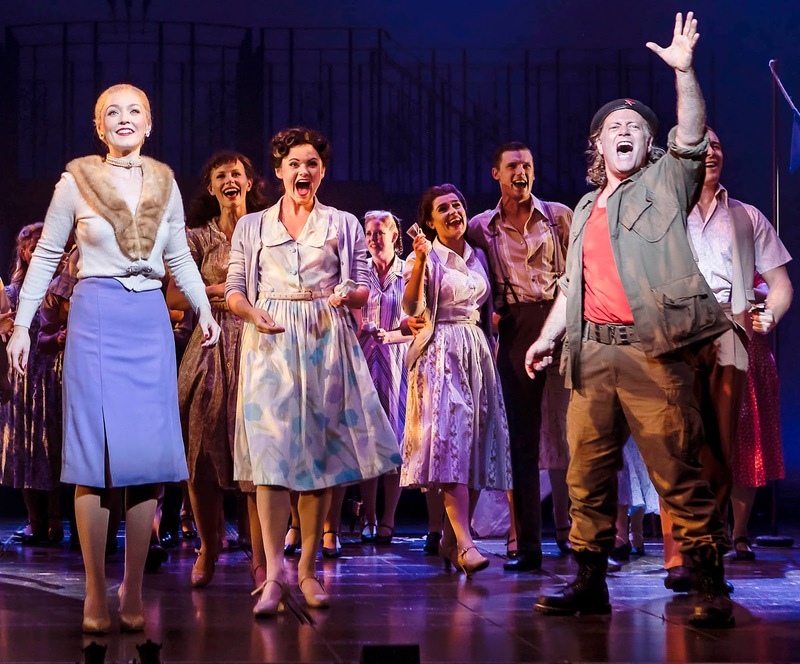 It’s also arguably the best musical from the renowned partnership between Tim Rice and Andrew Lloyd Webber. In this production, Eva comes across as a subtle prima donna, rarely over the top. 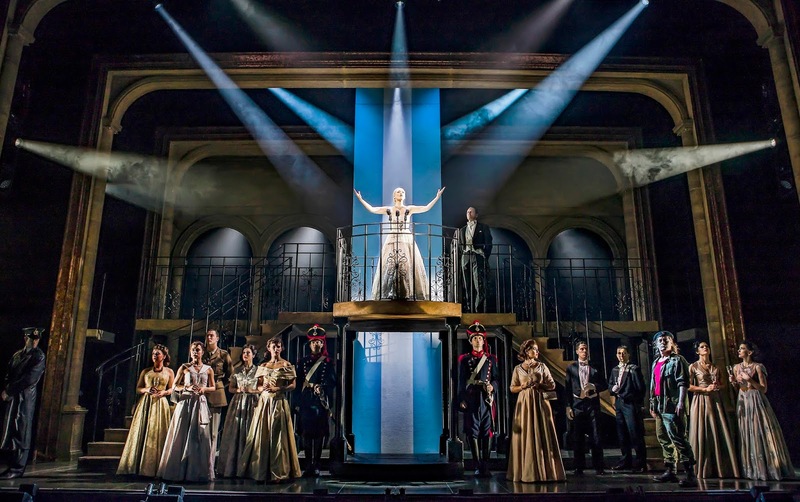 Lucy O’Byrne’s voice is well-suited to the title role and the iconic balcony song Don’t Cry For Me Argentina which is brought right to the front of the stage. Ultimately Eva’s ambition is found to be greater than her health and O’Byrne saves her best performances for the final half hour, injecting a convincing frailty into her movement and voice. Directors Bob Tomson and Bill Kenwright don’t encourage Juan Perón to be madly enamoured with his pushy beau. The arc on which the character shifts from being led by Eva at the beginning to being a step ahead of the failing thirty-something towards the end is well acted. Mike Sterling is faultless with a commanding presence on stage and beautiful baritone voice. Glenn Carter plays common man Che who commentates on proceedings. He has a solid voice, but eschews the sarcasm that would have brought a much-needed glint to Che’s voice. Christina Hoey impresses with her adolescent Mistress rendition of Another Suitcase In Another Hall. The company’s rendition of Requiem for Evita embraces the set’s religious imagery and is rewarded with an even better song in the second half. Santa Evita benefits from a great performance by an unnamed child from the local Stagecoach Theatre Arts School and contains rich harmony singing that sent shivers down my back. While Evita’s strength as a show is its catalogue of big songs that you can hum as you leave the performance, some of the best moments of the current touring production are softer scenes accompanied by Brian Streeter’s guitar. 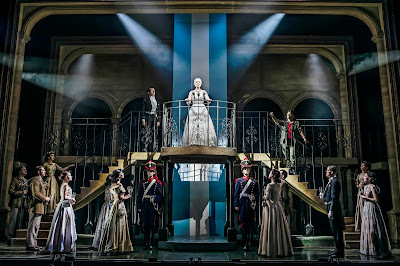 While there are moments in the first half when the music drowns out solo voices – unfortunate, because the intricacy and richness of the story is told through the elaborate lyrics – the balance improves in the second half. “Who the hell does the King of England think he is? Tea at some tinpot castle of his! What kind of invitation is that? Food for thought for world leaders, royalty and the public who can be so easily hoodwinked into thinking that those who rise to the top will keep their promises. I’ve a strong childhood memory of attending a touring performance of Evita in the Grand Opera House during the late 1980s. Bill Kenwright’s revival of the musical is surprisingly straight and risk-free with its direction, shying away from pulling too many heart-strings, and it allows the music to take centre stage. 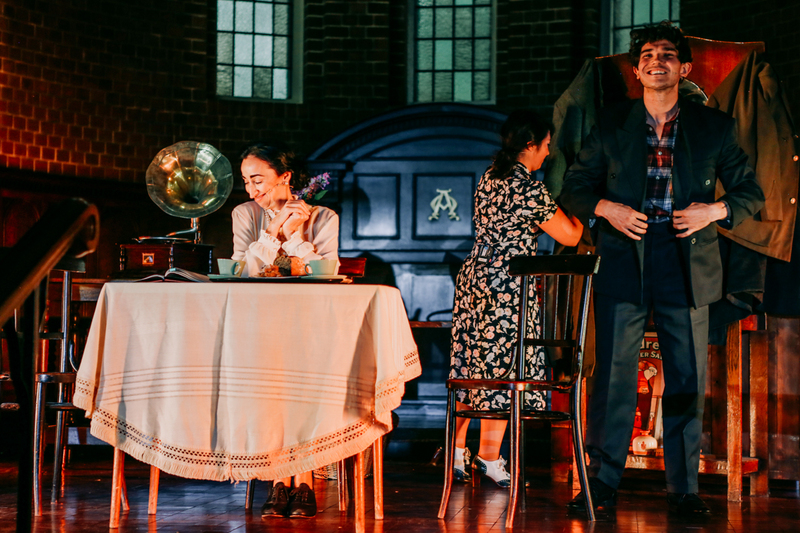 A number of the lead roles have recently been refreshed and the quality of singing and blending across the company is strong although there’s room for a greater Latin feel to the music. While much of the humour and cheeky playfulness that can be found in other more playful productions is absent, the cast, musicians and Matthew Wright’s flexible staircase set tell the story of Evita in a very satisfying manner. 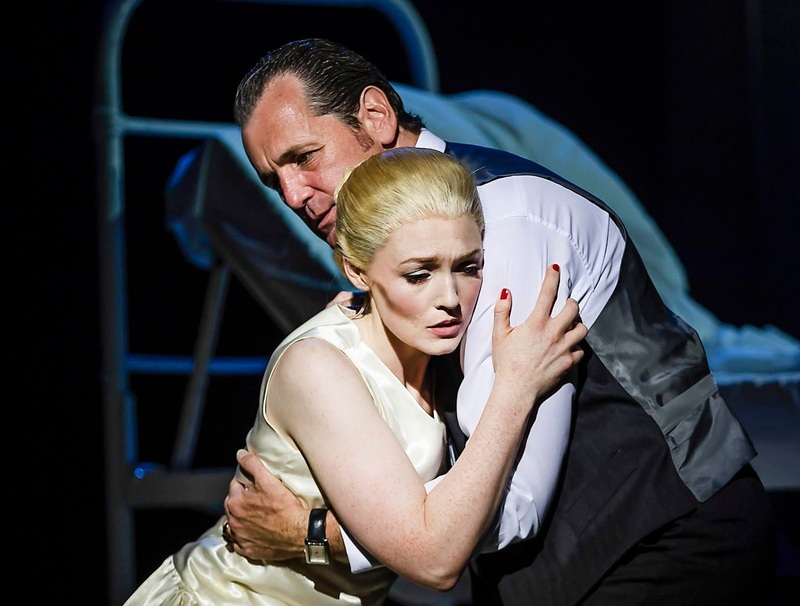 Well worth catching Evita during its two-week run in the Grand Opera House which finishes on Saturday 11 August.